Coating system for permanent corrosion protection on wet steel pipes and fittings at low operating temperatures, e.g. those coated with a condensate film. Fulfils class HR and THR in accordance with SG 0130-01 of GRTgaz (F). Can be applied to wet surfaces without special tools. Can be applied to pipes under load. Very good resistance to salt-containing atmospheres and soils. 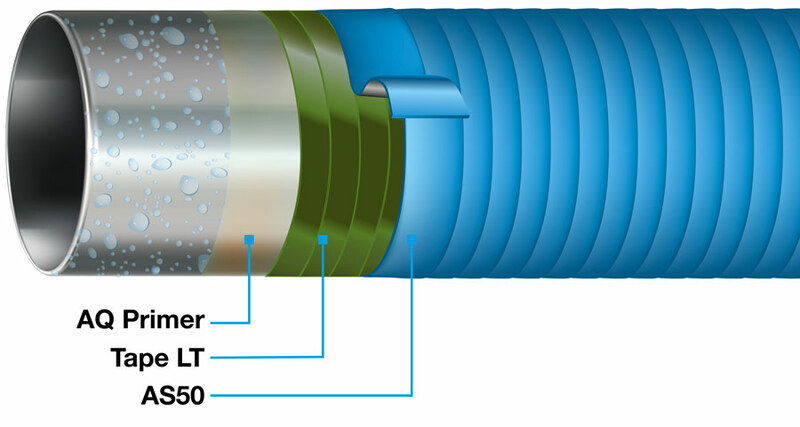 VivaxCoat®-LT is ideal for application on pipelines coated with a wet condensate film, where conventional coating systems cannot be used. Such wet surfaces can be found, for example, on pipelines that are under load or in areas where air humidity is high. VivaxCoat®-LT is ideal for pipe coating and rehabilitation on pipelines, moulded parts and fittings that are still in operation. VivaxCoat®-LT can even be applied over condensate films, which present a problem for other coating systems. The high costs incurred due to pipeline interruptions, and long waiting times when performing the coating work, can be prevented by using VivaxCoat®-LT. VivaxCoat®-LT is a proven solution with exceptional properties and high resistance to mechanical stress.